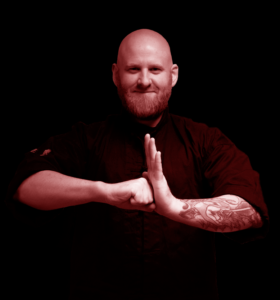 Neil’s martial journey began studying Wing Chun in 1998 and following years of intensive training as an indoor student of Wing Chun Dynamics’ founder Master Dave Taylor, he began his career as a full time kung-fu instructor in 2012. A focussed and positive individual, Neil’s eye for detail and background in physics set him in good stead to gain a deeper understanding of the scientific principles of Wing Chun Dynamics and to implement those concepts into his kung-fu and every day life, this training still continues. Awarded black sash with honours in 15 Treasures Golden Bell Chi Kung, making him one of a select few to be recognised at this level outside the temples of China. Opened full-time kung-fu studio in Bewdley, offering clients private tuition in Wing Chun Dynamics Kung-Fu and also guided Kung Focus sessions using Golden Bell Chi Kung techniques. The first of Master Taylor’s students to be awarded Instructor level in and granted permission to teach Golden Bell Chi Kung. Through his continued study in both Kung-Fu and Chi Kung, Neil has come to understand the deeper aspects of Chinese martial arts and that kung-fu is not simply about fighting. Neil stresses that when correctly applied, Wing Chun Dynamics is an extremely effective self-defence system but kung-fu is also about fortifying the mind and body to promote good physical health and mental well-being. Ultimately, to master kung-fu is to master oneself through dedication and diligent training. Kung-fu teaches the individual to understand themselves and strengthen both the body and the mind. Training to discover and master the self allows the individual to cultivate a positive attitude in an increasingly negative world; this, above all else is what Neil aims to pass on to his students.